A tell tale sign of a typical blogs/websites developed using Thesis wordpress theme without much customization is the grey color top navigation bar. I am also not sure why that the default position of the navigation bar is above the header image and not below it. 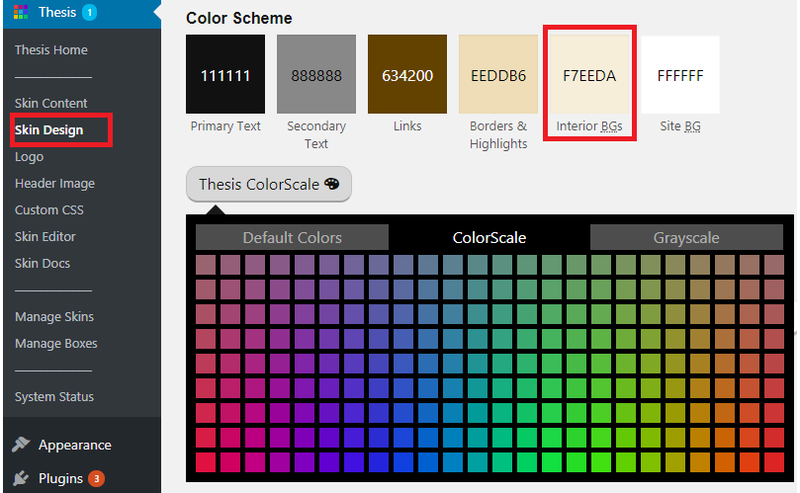 See the “Thesis ColorScale”? Click on it and a rich color scale palette would appear right before you. As you click on one of the colors, the colored boxes on the “links”, “borders & highlights” and “interior BGs” will change. Take note that navigation menu background color follows the “interior BGs” color tone. You may try different color combinations till you are happy with the color displayed on your “interior BGs” box. The navigation bar was previously the typical signature Thesis theme grey color. I have included a screen shot of the site here because I know I would be revising the site design from time to time. Also, don’t panic if the changes are not seen immediately after you save the changes in your Skin Design page. I have done it across my sites and noticed it is not updated immediately however the new color scheme is available the next day after I login to the sites. You can try it after sometime to access from your mobile phone to see of the new color scheme is correctly reflected on your site.